Making plans for November yet? Besides the turkey, I mean. I am, I've got November 16 on my calendar. 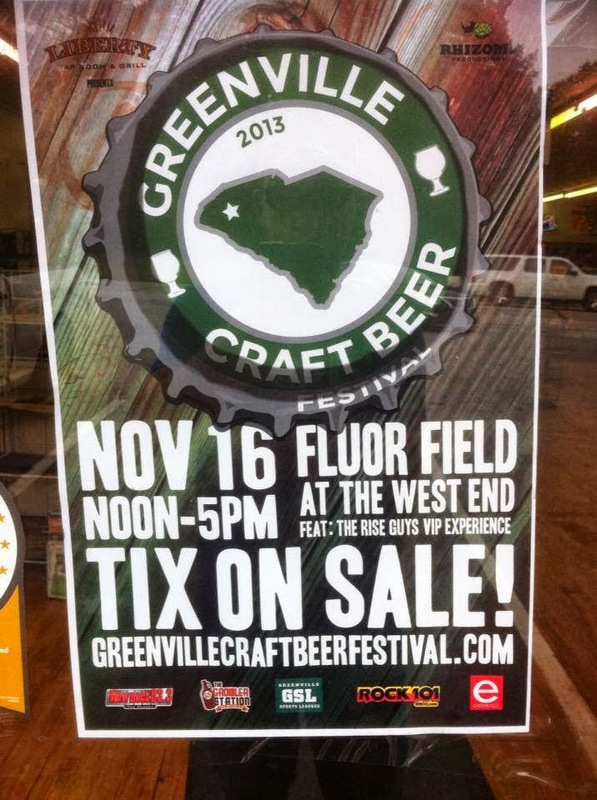 That's the date of the first-ever Greenville Craft Beer Festival, presented by Liberty Tap Room. This is gonna be fun, one, cause it's in the ballpark with lots of room to mingle, plus Greenville's Craft Beer scene will be well represented. And even if the weather doesn't exactly cooperate, there is plenty of covered space there so inclement weather will not impede my imbibing (for research purposes, of course). You have probably noticed, as I have, that the shelves/menu boards of your favorite beer purveyors are crowded with the Pumpkins and Octoberfest offerings of many craft breweries. So many beers, so many questions: which is best, how are they different, is the bartender ignoring me? 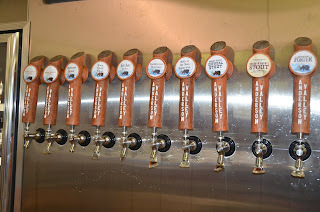 So, I decided to put them to the test to find out all I could, so the logical place was none other than the Growler Station where Certified Cicerone Server "Big" Jon Richards holds fort and dispenses mucho beer-related info. Notice that the color seems pretty consistent across the samples, consistent with the malt focus of these styles. 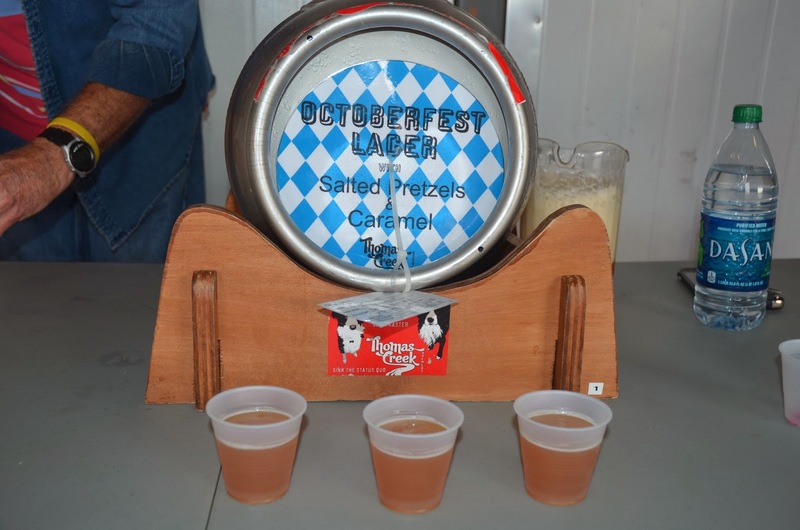 In an October Fest beer, the use of Vienna malts is classic, which gives it the gold to amber color. The pumpkins on the left both show a tanner head than the Octobers, probably from the use of real pumpkins in the wort. The Weyerbaucher was very spicy, with a bit of alcohol warmth in the finish, and plenty of traditional pumpkin spices noticeable, especially a touch of clove. very full bodied. The Dogfish Head was the closest of them all to being a regular beer, not overly spiced, good body and balanced sweetness. Very drinkable at any time. The Harpoon October was a good representation of the style. In the Marzen style, very malty from the use of Munich, Chocolate and Pale malts. Full bodied with a finish that is both soft and malty with a gentle bitterness. I'd drink this one again. Thomas Creek Octoberfest was very restrained in the spiciness, but with very noticeable caramel flavors and a creamy, full bodied mouth feel. Well balanced and the moderate ABV would make more than one possible, I think. Overall, I liked them all, with the Dogfish Punkin (named after a pumpkin throwing contsest in Delaware) being my favorite for drinking. Like Big Jon says, "it tastes like a beer, not a pie!" Punkin Ale is named after the seriously off-centered southern Delaware extravaganza Punkin Chunkin (check out some of these Discovery Channel videos of Punkin Chunkin, you gotta see it to believe it!). I've been visiting Asheville, NC, for several years now; it was here at Barley's Taproom and Pizzeria that I had my first Dogfish Head IPA, the 60 minute version. Life changing event! 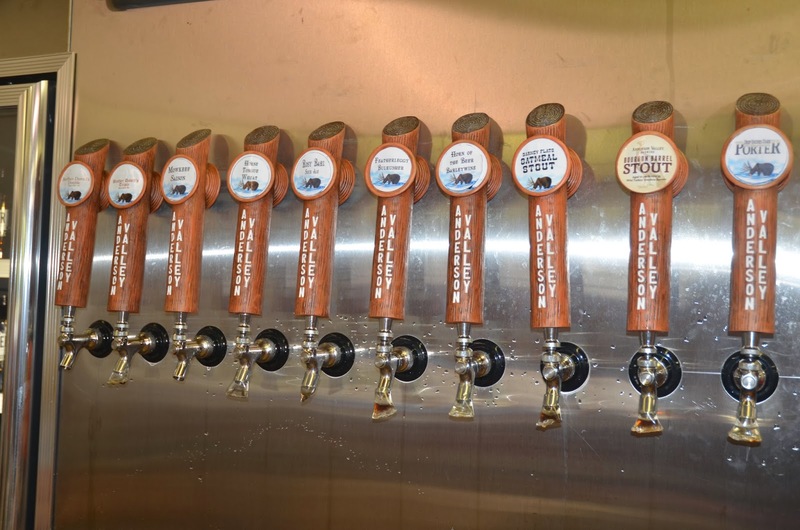 Well, now that I am a neighbor (just down the road about 55 miles) I've been spending some time getting to better know the town and its expanding craft beer scene. No shortage of venues, as this web page shows. And, as I have just learned, no shortage of ways to visit them. Take the Amazing Pubcycle, for instance. I first encountered it on Biltmore Ave this past Sunday after I visited Wicked Weed again (more about that later). Mostly pedal-powered (there is an electric motor assist) this "bike" allows 10 pedalers (and 3 layabouts on a bench) to get from brewery to brewery in the downtown area without parking hassles or having to ask for directions and to work off a few calories in the process. A group leader pours for fellow adventurers. Employees can't serve or sell; it's a BYOB situation. This group had just left Wicked Weed when I found them. They were having fun, eager to get to the next stop. I'll have more to say about this "pub on wheels" after I have personally participated, probably in the next week or so. °Freak Double IPA; a treat for hopheads like me, lots of West Coast varieties keep the citrus and dank aromas and flavors very forward. Our favorite of the group. ABV 8%. °Dirty Weeds; a black IPA with lots of Summit, Columbus and El Dorado hops. This ale was made with the collaboration of ACDC's bass player, Cliff Williams, so you know this one is big. ABV 6.8% of hoppiness. So, that's one brewery down, many more to go. I'll keep adding more in the upcoming days as I get the time to pay them a visit.These are the ones on my list. And of course, there are plenty of events here in Greenville to cover, so I'll be a busy (but hoppy) boy in the near future. Stay tuned! !